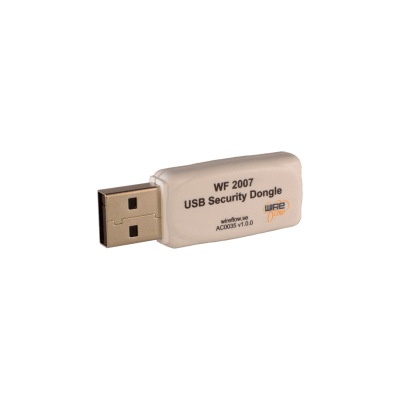 The WF 2008 from WireFlow is a USB security dongle for all LabVIEW (Windows/Mac/Linux) targets with access to an USB port. It may be used to protect LabVIEW based systems from being duplicated without permission, to unlock features in the software etc. Contains; Security Suite Programming Application, Device Driver, User Manual and Quick Guide. FAQ: What is the difference between the WF 2007 and the WF 2008 dongles? A: The WF 2007 dongles is used for targets running LabVIEW RealTime (RT). The WF 2008 are for targets running “standard” LabVIEW, i.e. LabVIEW for Windows, Mac and Linux. FAQ: What items do I need to purchase and/or download to use the WireFlow dongles for protecting my LabVIEW application from being duplicated? 1. 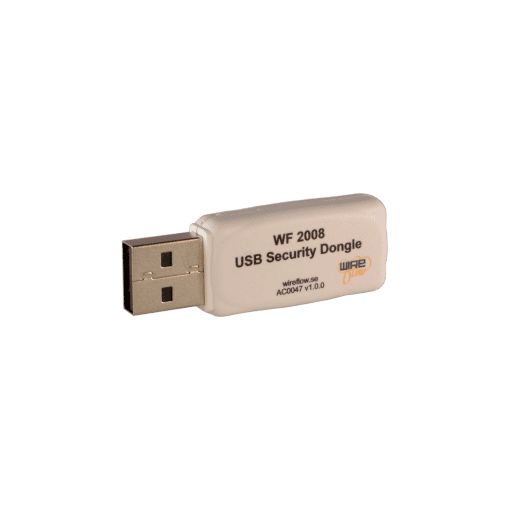 Download the WF Security Dongle Software Package. (Article no AE009) from WireFlow. You need one such license. 3. Buy some WF 2008 (Windows) or WF 2007 (RT), USB Security dongles from WireFlow. You will need one dongle for each system you want to deploy. a short step by step instruction for how to create your security solution. The dongle has a secure memory to hold secret keys and data. Using the supplied LabVIEW driver, the presence of a dongle with a certain key is queried using a new random challenge each time. The key never leaves the dongle, it just sends the resulting hash back to the driver. This ensures that the dongles cannot be copied or imitated. Protection against brute force attacks is guaranteed by using industry standard SHA-256 hash algorithm with 256 bit keys. This means more possible key values than there are atoms in the sun! NI Alliance Partner, WireFlow AB, demonstrates how the LabVIEW Real-Time software in a CompactRIO is protected from unlawful copying by using an USB protection dongle. Magnus from WireFlow introduces the WF Security Suite which is a software protection system for LabVIEW applications based on hardware dongles. Demonstrates how to use the WireFlow Security dongles to perform remote validation between two different applications.